Bringing a group for a Journey Quest trip? We’d love to help you make your extremely effective and fully successful. Below are some materials you can use to help promote your trip to with group. New items will be posted as they are created, so check back often. Streaming versions of our videos are available on YouTube or Vimeo for sharing on social media or in email. The downloadable versions are higher quality and will be useful if you want to show the video on a projection system or anywhere you won’t have a reliable internet connection. This is a 2 minute video about Journey Quest’s whitewater rafting trips. It includes clips from all water levels in Bighorn Sheep Canyon and the Royal Gorge. Right-click and choose “Save As…” to download the files to your computer. This is a 6 minute video about Journey Quest’s combo trip, showing a sampling of the activities and some of the ministry that takes place on these trips. 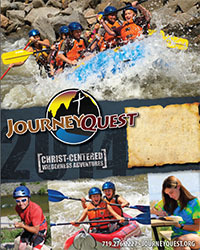 This is a full-color poster and bulletin insert flyer to advertise your trip with Journey Quest. There is a space on the poster to put your group’s name, trip dates, and a contact person. 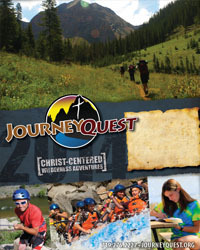 Here are several sizes of Journey Quest’s logo suitable for publishing on a website or in a flyer, church bulletin, etc. Use the vector or the large version for printed media and the small or medium version for web sites.